Top left: interference pattern of a fibroblast cell acquired by means of lens-free imaging. 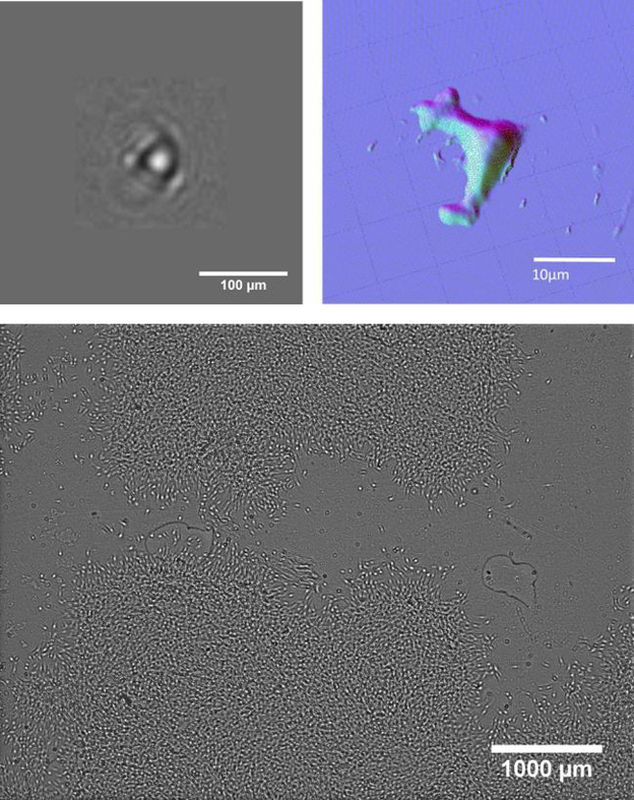 Top right: holographic 3D reconstruction of the fibroblast cell. Bottom: thousands of fibroblast cells at a glance, a section of a 24-square-millimeters field-of-view. Credit: CEA-LETI, Cédric Allier, Srikanth Vinjimore. A team of researchers at CEA-Leti, Grenoble in collaboration with UCLA have developed a lens free imaging technique that allows them to observe objects across a wide field of view. This technique can be used for imaging live bacteria, cells and viruses with greater visibility and differentiate and study them easily, making the technique ideal for time-lapse experiments. The CEA-Leti’s lens free imaging technique is capable of imaging at 2 micron resolution over a field of view spanning 24 square millimeters over a extended period of time. This technique has been successfully used to detect single bacteria and viruses, and now researchers are working on enabling live imaging of 2D and 3D cell cultures. The technique uses liquid microlenses created using thin wetting film on top of each mounted object, and the contrast is sharpened for detection while monitoring. This technique is a combination of optics and fluidics at nano or micro scale along with the wetting film. The wetting film approach is not just confined to this new technique but can also be used to improve the detection limits in conventional microscopes as well. Further research is being carried out on the CEA-Leti’s lens free imaging technique to develop lens free video microscopy with larger field of view with the capability of being operated over extended periods of time that can be used directly in cell incubators. This will help researchers in further understanding cellular development.